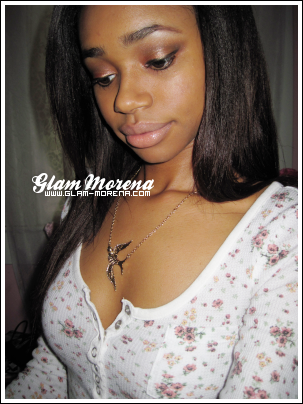 Glam Morena: Face Of The Day: Before Work. Face Of The Day: Before Work. I just wanted to do a quick FOTD post before I head off to work. Surprisingly, I've been wearing A LOT of neutral looks these days. I have so many things to post about, I just have to find the time. I get off work at 11pm and the next day I'm completely exhausted! BY THE WAY, SUBSCRIBE TO MY YOUTUBE CHANNEL! I am going to start uploading videos really soon. So sometimes instead of posting a regular post, I'll upload a video. You look beautiful! Yay for YT! I`ll subscribe for sure. Make sure you are eating healthy, drinking a lot of water and taking multivitamins, you need your energy even if you`re working long hours. Take care. u look pretty - yahh for neutrals that my lok of late also -love that top ! You look so pretty; both with brighter colors and neutrals :) Love your necklace too! And yay for youtube videos, I'll be subscribing for sure! :) Take it easy at work! Congrats on the job! You look beautiful! Very professional in the neutrals. Not boring. LOVE IT! i recently got into revlon's colorstay for about a month now, it's amazing, this stuff doesn't budge! u look very pretty..good luck on the new job!! i love neutrals and you look gorgeous in them! keep it up, your hair is so pretty! I def love your eye make up :D Great job! Love the look! & Congrats on the job! i Love neutrals.. but i been wearing it wayyy too much.. i miss my color! i love this look, but i have to ask what shirt are you wearing? i love it!